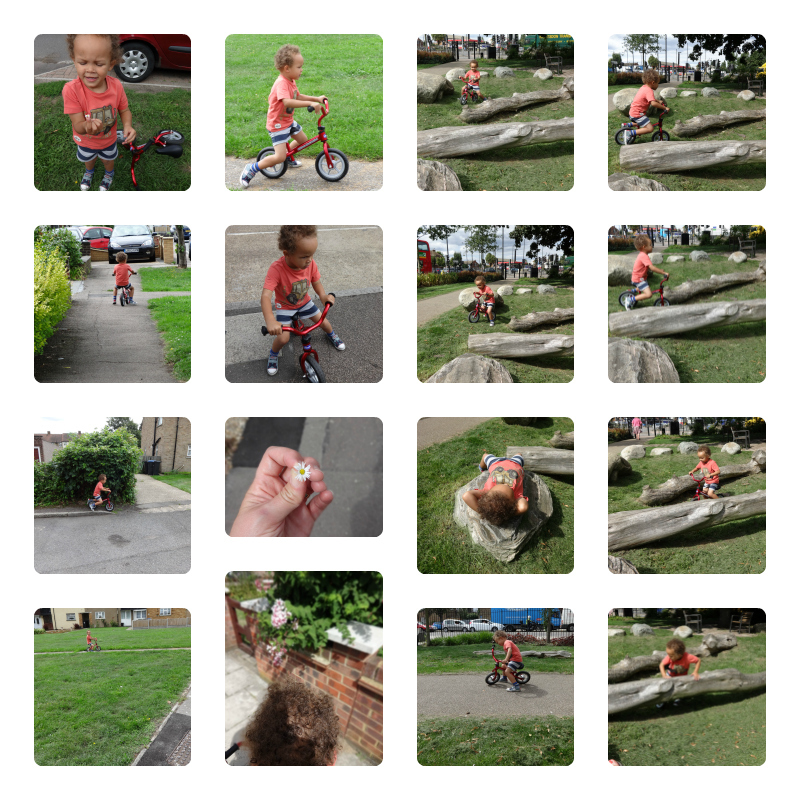 The last few days I have been walking, with Aaron cycling, to the shops with Aaron and it is a 30 minute walk each way. Tuesday we went to Siobhan's and it's even further. He was on his balance bike every time. It's great as I get to walk as fast or faster than I did with the buggy but without the hassle of pushing it. If you have a toddler who slows you down, get a scooter or balance bike. We've had the former and now we've progressed to the latter. I can honestly say the bike is better, as in his scooter days he used to keep stopping and slow me down; on the balance bike it is the reverse and I struggle to keep up with him. Anyway, I don't drive, so Aaron's always on pavements and roads out and about with me. I thanked God for that many times this week, as he speeds off on the balance bike and it is impossible to keep up. Because he has been off reins for a LONG time he is sensible enough to stop at every curb and wait for me. Plus the fact that his feet are constantly in touch with the ground (well nearly always) means he is in good control. He only free wheels when going down a slope, which he did a lot yesterday and today, but in controlled spaces when he is doing "stunts" (on grass slopes not road/pavements). We BOTH learned our lesson from a couple of weeks ago when he went down a hill in Hampstead Heath and ended up with a cut knee - he is still sporting the plaster. Anyway here are some pics from the last few days. Monday was mainly on paths next to grass but when we were on roads he knew to keep on the pavement and wait at EVERY curb! Above, he stopped a few times to look at flowers or pick me flowers - I photographed the daisy but he also picked me some lavender which we spent ages smelling. Look at the pic where he decided to lie on a rock. He said he was tired from doing stunts. Where you see those trees in the pic, he cycles down a kind of valley bit, again and again. He zooms off, but bless him, he waits at every curb. I thank God he's spent the last 3 years being a pedestrian with me, and is therefore very road and pavement savvy. He also knows unexpected things happen. As below he knows all about red and green men at pedestrian crossings. A word of warning, do NOT 100% trust the green man and don't allow your child to either; Aaron knows not to go simply just because of a green man. He knows to get a verbal "yeah okay" from me. We had an incident a few months ago where a cop car went through a red light (green man to us) and did NOT have its sirens on. Worse still, it had stopped at the preceding junction (which is when we looked up). We then walked to the island, and it was when we were on the second half of the road that it decided to zoom through. Aaron was one step ahead of me (this was pre-balance bike) and I grabbed his hood, only just in time. Yes that cop got a tongue lashing from me. I know Aaron's going to need a bike with pedals in the not too distant future - he's REALLY good on the balance bike. Then it will no longer be an option as to whether we go out without the helmet. I am useless a at strapping it on and the moment, so we've been opting to leave home without it. I am right by his side the majority of the time, but what I would really love is if we were BOTH on bikes. In a previous post I explained how we got my bike out of the garage, after it not being used for 4 years. The local cycle repair man gave it a full service for only a fiver. I went out on it that day, but it was because the husband was with us, so if I sped off he could take up the rear and mind Aaron. I haven't had the courage yet to go out just me and Aaron on our bikes. When I was little my favourite Aunt used to cycle everywhere, including from Paddington, where she was a nurse at the time, all the way to Tottenham to see us. She used to take me out cycling but she would insist we cycled in the road, and not on the pavement. I used to stick like glue behind her, and as close to the curb as I could get. Boris seems determined to make cycling a big part of London life, what with the new Ride London event, which I think they are hoping will be as big as the London Marathon in years to come. At least when they are participating in that, they don't have to worry about traffic and car accidents, as lots of roads where cleared for them, much to the disdain of a lot of drivers. I heard many complaints on LBC 97.3 as the roads were closed way longer than they are for the marathon! 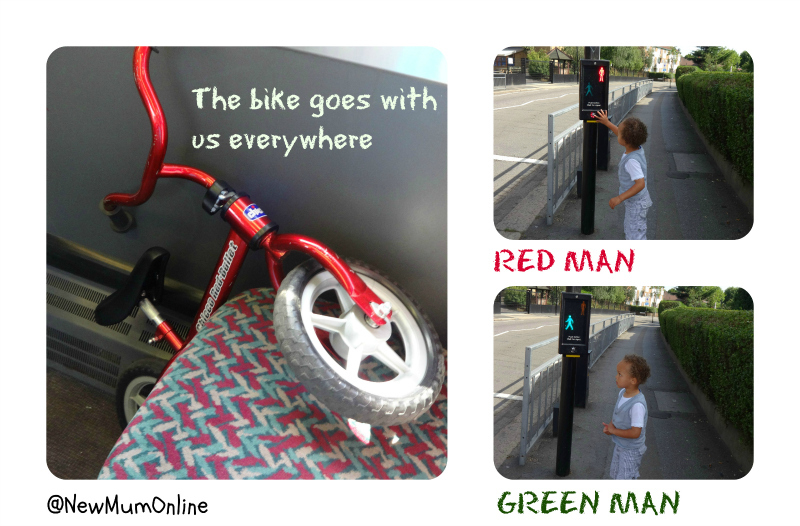 In the red man green man photos above, we are on the way to Siobhan's and I have taken his bike off him for a second, so that he can press the button and cross the road. Normally I let him cross with the bike, but very slowly, and right by my side. Aaron's only 3 but I would instil road safety from a very young age, as you can't account for everything, so to have them confident and as trust worthy as possible is important. When we are out and about I don't want him running in front of a car because his ball has gone in the road, or because he's seen a friend. I want him to know better. I want to keep my son safe. We've seen the ambulances that arrive after a road traffic accident and Aaron is, bless him, very cautious. We've never had locks on our cupboards or drawers either, as for the same reason I believe teaching lessons is better than simply, you can't touch. I think they learn more, when they know the reasons for things. It is much more empowering. I spoke to him in full sentences since he was born, and now his vocabulary and speech is testament to that. What road and pedestrian safety do you teach your child? Have you had any near misses you could tell us about so we don't make the same mistake? I think I will be telling my cop car story till the end of my days, as I truly never saw that coming. It shows, like we were told when we were little, it's not just look left, look right, but also LOOK AGAIN. In terms of actually being on the road, in the car, I sit in the back with Aaron and he has a very good Britax car seat and I always have my seat belt on. We're often saying "slow down Daddy". The main thing, with being a pedestrian and being in a car, is watching for what other people are doing. It's all about being with it, and having the correct time to respond and react SAFELY. We have a good time when we are with children. Its an amazing moments when we are with family.Thanks for sharing this wonderful share.